Sony has furthered its smart TV line-up in India by introducing two new smart TVs to the public. Recently Sony announced the launch of Bravia KD-85X9000F and KD-65X9000F. These two models which are 85-inches and 65-inches respectively will debut at the price of Rs 12,99,900 and Rs 3,39,900. The TVs are going to be available across all Sony centres and major retail outlets. These two new additions to the series are advancing the line-up which started with the launch of X9000F 4K HDR Android TV earlier this month. The KD-55X9000F is also an option for 55-inch TV at the price of Rs 2,39,900, which is already available across India. The TVs in the X9000F series come with the 4K HDR panel which promises phenomenal audio-visual experience to the users. All the TVs also come with the TRILUMINOS display which produces accurate reds, greens and blues on the screen to maintain the impressive colour dynamics. What drives these TVs is Sony’s 4K X-Reality PRO image engine and 4K HDR Processor X1 Extreme from inside the hood. The processor combined with Sony’s algorithm of reality creation database works to create life-like picture possible on the screen. Speaking of software, all the TVs from Sony run on Android 7.0 with company’s own skin on top of it. Besides the Google Play access which will ship with the TVs which is because of Android, there is an awaited update of Smart Home Ready which is going to bring AI capabilities to the TV to enable smart communication with other devices in the home. There is also built in Chromecast to allow easy streaming from any device. Users also get very easy access to Netflix and Google play through a dedicated button, with a single touch. The connectivity options include Wi-Fi 802.11ac, Bluetooth v4.1, four HDMI ports, three USB ports, and an Ethernet. Additionally, the X9000Fs also include features like Cinematic S-Force Front Surround, ClearAudio+, DSEE, and DTS Digital Surround besides sporting 16GB on-board storage. 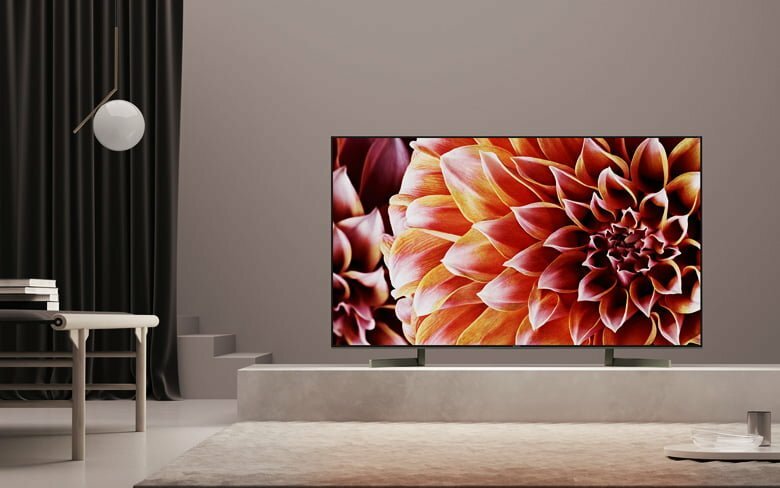 Being the most premium of the TVs from Sony, the company has also put in its proprietary technology that is the X-tended Dynamic Range PRO which will work to uplift the HDR and non-HDR content by adjusting the backlight levels precisely for each zone of the screen. The technology has been rated to deliver six times the XDR contrast of conventional LED TV. There is also the X-Motion Clarity that hits the issue of showing motion blur in fast-moving scenes. As per Sony’s claims, the X-Motion Clarity makes use of the built-in direct LED local dimming and backlight boosting algorithm on the Bravia X9000F range to control the luminance and optimise its duration. Because of this, the X9000F is able to render clear and smooth visuals. I wouldn’t buy anything from Sony. Way overpriced phones and TVs. Plus they’re not investing in R&D. Most of the stuff like Triluminos display, Bravia Engine etc are all marketing words, and they source the panels from Samsung and all. 12 lakhs for a TV? You could get a similar TV(Not Sony) way cheaper out of India.